Bienvenidos/ Welcome to Quepolandia, we are here to make sure you have an unforgettable adventure. So get out and enjoy being away from those freezing temperatures. So whether you are here for Envision Festival, hiking one of our incredible National Parks, or just chilling on the beach don’t forget to hydrate (not cervesas) and sunblock, sunBLOCK SUNBLOCK!!! The 9th Annual Envision Festival is underway in Uvita (Feb. 28- March 3). This four day event is filled with music, yoga, art, and workshops to help open our minds to making this a better planet…..TOGETHER. Spreading peace, love, and knowledge not footprints and waste (100% plastic free event). We want to thank Eric Allen for sharing some love and an incredible sunset from Envision 2018 with this month’s cover shot. A lot is happening here in March as the action continues. 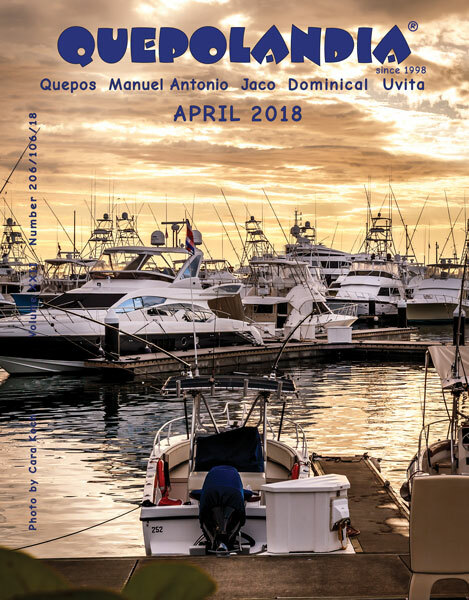 Marina Pez Vela is hosting the 8th Annual Quepos Billfish Cup (March 15-17) Always a great time. In addition to a fleet of boats, fantastic tours, spectacular restaurants, air conditioned shopping, the Marina is also the home of Gelateria Amorosi. So come and cool down with the area’s most delicious Italian Gelato and treats. Tell them we sent you; our advertisers love to hear it. Don’t miss movie night under the stars every Friday night on the big screen. It’s a wonderful night out for the entire family. March Madness is upon us so all you college basketball fans can catch all the action and great food at Jolly Roger or Sancho’s on the mountain, or Kamuk Casino in Quepos. Bienvenidos…Welcome 2019, we hope you had a wonderful holiday. High season is upon us here in Costa Rica and we are glad you are here to be part of it with us. Green season has provided us a beautiful backdrop to begin this New Year of adventure. Our magazine is filled with the best of the best this southern Pacific has to offer. Try something new this year like sport fishing for a record Marlin with Marina Pez Vela. Either offshore or onshore the fishing season has arrived so get out there and catch your dream. Thank you to Paula RM at Caiman Photography for your spectacular cover photo this month. As you can see the fish (and mammals) are literally jumping out of the ocean. Want to party like a rock star than get to the marina for the Pelagic Rockstar Tournament Jan 11-13th. Try zip lining or exploring the canopy tree tops with Hacienda Barú or Titi Canopy. Paddling through the mangroves or down one of our incredible rivers with Tucanes Tours. Hiking through some of the most beautiful National Parks in the world. Take ATVs to explore a waterfall with Monkey Ride. Just chillin’ at the beach? Try parasailing or learn to surf with Aquas Azules. They will have you hanging ten in no time. So let the Pura Vida lifestyle set the pace for your 2019. Life is short…GO LIVE IT!!! Looking for great food, great drinks, and great NFL Football? Stop in at Byblos Casino or Sancho’s on the mountain or Kamuk Casino and Sports Bar in Quepos to catch all the sports action. PAWS is holding their 8th annual Battle of the Bands on January 27 at Ronnie’s Place in Manuel Antonio. So if you’re looking for great music, great food, great people, and a really GREAT cause, this is the place to be. We would like to welcome our new advertisers this month: Abogados Leiva y Asociados, American Export, Costa Rica Escape Bus, CR Surf, Eden’s Nest, Fab Body, Islas of Manuel Antonio, Krisa Curtains and Blinds, and Outlier Legal. 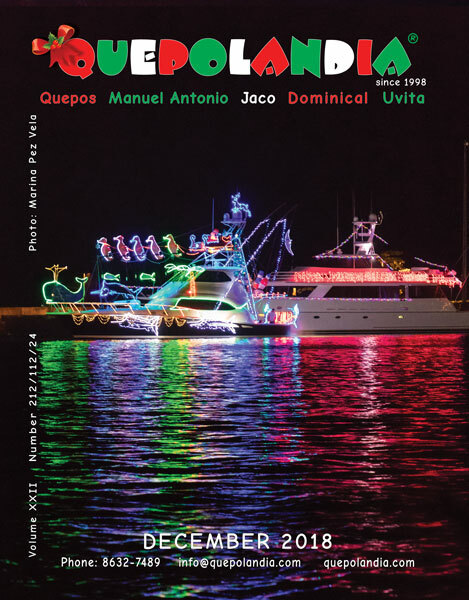 We are always looking for great cover photos so please send us your best shots to info@quepolandia.com for future consideration to have your pictures make the cover. We hope you enjoy our magazine and it helps guide you through this enchanting paradise we call home. You can always follow and share us here or Facebook/Quepolandia. We appreciate and welcome your comments. Have a Happy 2019! Bienvenidos….Welcome to the Rain Forest—can’t say the brochure did not warn you. It will probably rain a little while you are here, but don’t let that stop you. Manuel Antonio National Park is in full bloom which attracts frogs, hummingbirds, and butterflies. It is also baby season here in the jungle so look closely as a lot of monkeys and sloths are carrying babies on their backs. The Humpback whales and their calves are still here so get to Marina Pez Vela for many options to view them, as well as world class sport fishing. The Marina will also be hosting the first Fishing Tournament of the season open to all ages. The Dorado Open will be held Nov 17 so get out and enjoy all the festivities. Don’t forget the 7th Annual Quepos Open Tennis Tournament being held November 3-4 with finals on Novemember 10-11 at the Tennis Club Quepos. Our rivers are also flowing so check out Quepoa Expeditions or Tucanes Tours for some thrilling rafting. Our many fine restaurants are serving up your favorite culinary delights. It is a good idea to call ahead this time of year. We would like to wish everyone a wonderful and relaxing Thanksgiving. La Colina will be hosting their annual Turkey dinner. Toys for tots will have their collection boxes around the area. so let us help the children by dropping an unwrapped gift to help brighten someone’s holiday… Santa Clause can always use our support. Thanks to Jack Ewing for the amazing Jaguar cover photo. We would like to welcome our new advertisers this month, Buena Vista Beach Villas & Uvita Law Firm. Bienvenidos…Welcome to our piece of paradise. We are sure you will have a great time. There are so many wonderful things Costa Rica has to offer and we have them right here. Amazing beaches to surf, stroll or just tranquilo. For an over the top view of Manuel Antonio National Park (National Parks Day Aug. 24th) try parasailing with Aguas Azules. World class sport fishing and a fleet of boats to get you there are waiting for you at Marina Pez Vela. 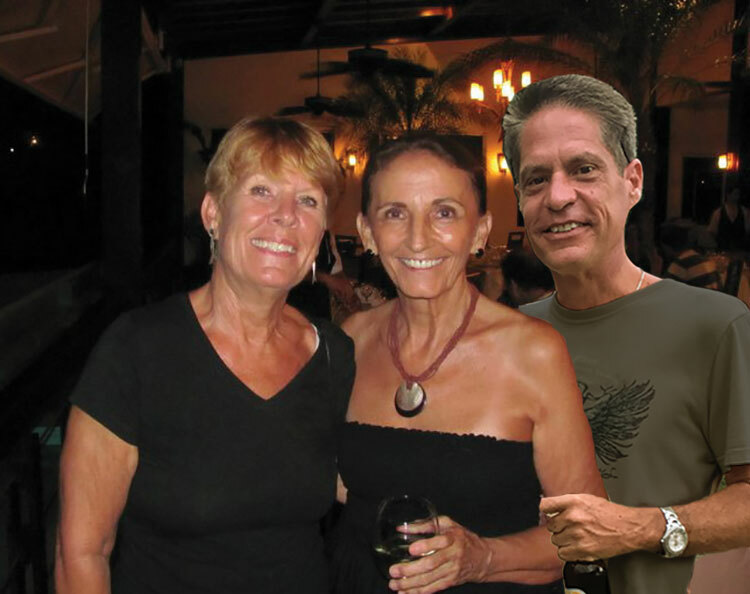 We have tours from skydiving with Skydive Costa Rica to scuba diving and everything in between. Whether you want to relax and enjoy our nature in the mangroves or for a little more adrenaline try white water rafting with Tucanes Tours. Our mangroves and rivers are as magical as our coastline. To experience the jungle canopy there is nothing like ziplining (Titi Canopy Tours). Or the first of it’s kind EcoTram at Hacienda Barú (tell Jack we sent you). August is whale season so while you are enjoying your cocktail at our many fine restaurants with a view, pay attention to the coast you never know when a family of Humpback Whales will go swimming past. We would like to wish all you mothers a very happy Mother’s Day (August 15th). We would not be here if not for you. So do not make mom cook; take advantage of our incredible selection of fine restaurants. She probably would not mind a massage either. Need more reason to celebrate? August 3rd is International Beer Day, so try one of the many microbrews at Fuego in Dominical. Also, International Rum Day is August 16….”cheers, salud”. We would also like to welcome our new advertisers Flutterby House, MiniPrice Store, and Sea of Green Designs. Thanks to Rodolfo Guzman for the Helmet Headed Basilisk cover. We hope you enjoy our magazine and it helps guide you through this enchanting paradise we call home. You can always follow and share here or on Facebook. We appreciate and welcome your comments. I can’t express how proud I am to be carry the torch of what these two incredible women have accomplished . 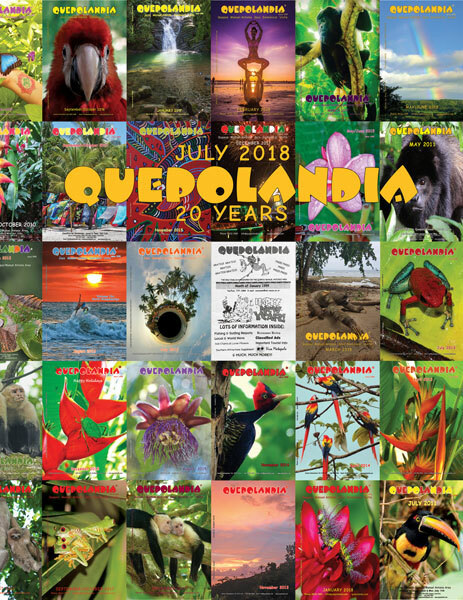 Quepolandia has grown from a small photocopied flyer in 1998 to circulation of over 3000 issues a month from Jaco to Uvita with a web platform with over 250,000 organic views. We want to truely THANK all of our writers, advertisers, and loyal readers over the years that have made this publication stand the test of time. We could never have done it without you. We want to thank the magician behind it all Paul Rees this is his 100 edition, he gets better with each issue. I would truly be lost without you. Looking forward to your next 100 issues. 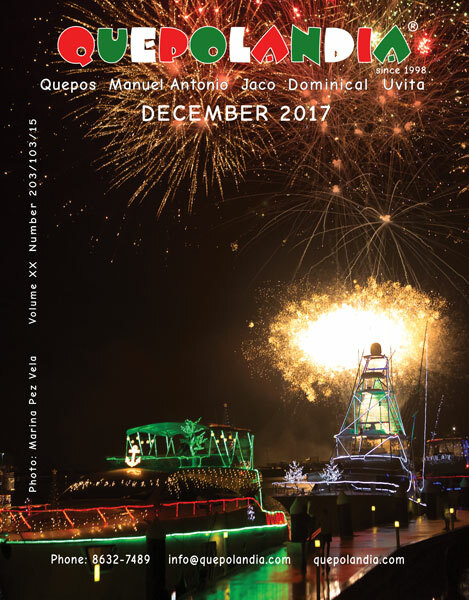 For all expats, ticos and tourist Marina Pez Vela will be celebrating 4th of July starting at 3pm with fun, food and music with a firework show at 8pm so get out and enjoy some Independence great food, and live music. Bienvenidos… Welcome and thank you for coming. The Southern Pacific has so much to offer we are sure you will not be disappointed. Whether you are exploring our many National parks, fishing for a record Marlin, enjoying our spectacular beaches or many exhilarating tours. This is the place to DO IT. After a day of adventure don’t forget to pamper yourself with massage or Reiki. Maybe even a private chef to prepare your meals. Remember it is your vacation. You deserve it. May/June is the beginning of green season and the turtle season. Happy Mother’s Day and Father’s Day to all. World Oceans Day is June 8th so while enjoying the beach make a habit of bringing something in which to collect some trash and leave the beach better than when you arrived. June also kicks off World Cup Soccer. Costa Rica’s national team will be traveling to Russia to defend their remarkable performance from Brazil in 2014. I have never ever seen a whole country come together in such a celebration of true pride and joy. Catch all the action and celebrations at Jolly Roger and Sancho’s on the mountain, Double Hook at the marina, or Fuego in Dominical. So get out and be part of history as Costa Rica goes all the way in 2018. OLEEÉ OLÉ OLÉ OLEÉ TICOS TICOOOS….VIVA COSTA RICA!!! 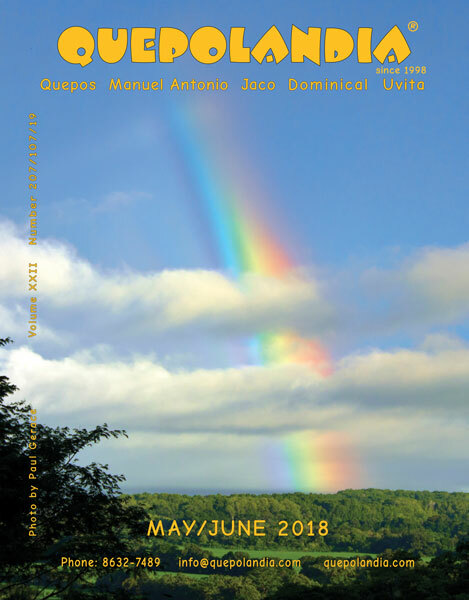 Thank you to Paul Gerace for the incredible rainbow photo for the May/June cover. We also want to welcome our new advertisers to our pages Ask Zipy, Canton de Quepos Chamber of Commerce, Spice of Life, & Tony Corona Tours. We hope you enjoy this magazine and it helps guide you through this enchanting paradise we call home. You can always follow and share us here or facebook.com/quepolandia. We appreciate and welcome your comments. Bienvenidos… Welcome to the land of Pura Vida. We are here to help you make this an unforgettable vacation. April is a very busy month. So have patience, relax, and enjoy. The action starts with the MPV Open (April 12-14) at Marina Pez Vela. Followed by the Offshore World Championship (April 16-20) with top teams from around the world competing for the Championship. Don’t forget Movie Night Under the Stars great night for the entire family. April should also bring a little rain to help cool things down and provide some incredible sunsets. So get out to one of our many great restaurants such as Aqua Azul, Arbol, or Mogambo on the hill, Mira Olas in Quepos for spectacular sunset views and delicious cocktails. In Dominical check out the river views from Mono Congo or Fuego Brewery. Bring your camera as we are always looking for great covers. Be careful this time year the rip tides can be very strong and sudden. Remember to swim sideways parallel with the shore and not into the current, and don’t forget the SUNBLOCK. Earth Day is April 22nd and Selina’s and the Earth Day Network will be celebrating with workshops, art, and music designed for the entire family. The Earth is an incredibly complex and vibrant ecosystem, where living organisms interact with each other and their environment to create the ideal conditions for Life. So in the words of Bob Marley “Let’s get together and feel alright”. We want to thank Cara Koch of La Vida in Life Photography for the fantastic cover shot. Welcome to our newest columnist Paul Gerace. We hope you enjoy this magazine and it helps guide you through this enchanting paradise we call home. You can always follow and share us here or facebook.com/quepolandia.. We appreciate and welcome your comments. 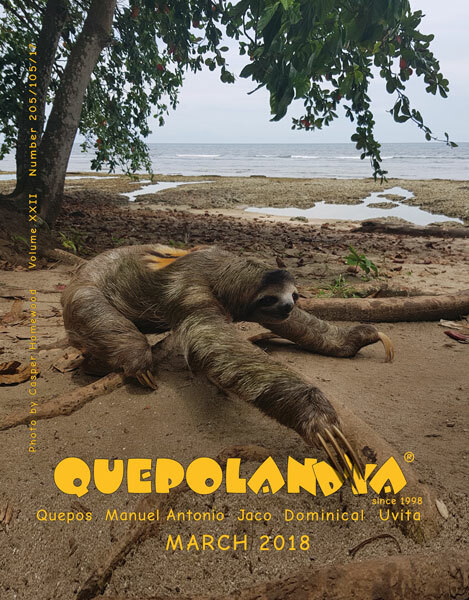 Bienvenidos… Welcome to Quepolandia, we are here to make sure you have an unforgettable adventure. So get out and enjoy being away from those freezing temperatures. Whether hiking a national park or sitting on our wonderful beaches don’t forget to hydrate (NOT cervezas) and sunblock sunblock sunblock. A lot is happening here in February. For all you rafters El Chorro is now open so have Quepoa Expeditions guide you to a spectacular trip. Our rivers are as magical as our beaches and should not be missed. Catch the Super Bowl Feb. 4th at Jolly Roger or Sancho’s on the mountain, and Marina Pez Vela will have it on the big screen in Quepos. Don’t forget movie night under the stars at the marina. A great night out for the whole family and it’s free. Time to start thinking of that “special” person, Valentine’s Day is almost here. So make reservations at one of our many fantastic restaurants: Arbol, Fuego, Gabriella’s, or OSA Thyme…just to mention a few. 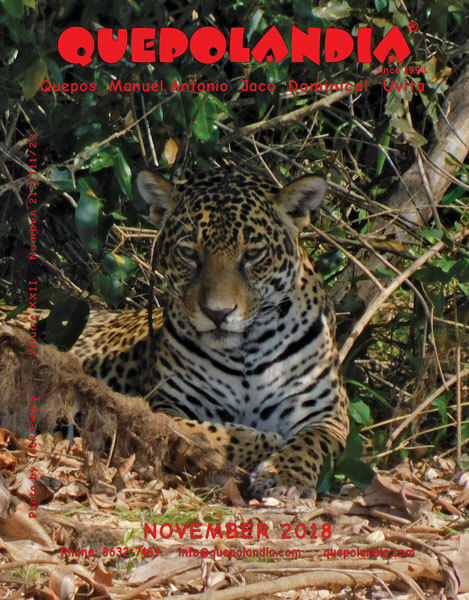 We would like to welcome our new advertisers that help make this magazine possible, Aguahara, Crocodile Man Tours, El Faro Restaurant, Ennio Afilador de Cuchillos, and Las Cascadas. We hope you enjoy our magazine and it helps guide you thru this enchanting paradise we call home. You can always follow and share us here and facebook.com/quepolandia..
Bienvenidos…Welcome 2018, we hope you had a wonderful Holiday. High season is upon us in Costa Rica and we are glad you are here to be part of it with us. Green season has provided us a beautiful backdrop to begin this new year of adventure. 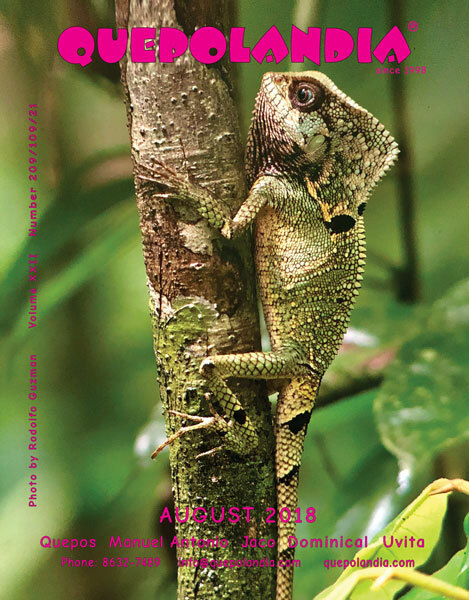 Our magazine is filled with the best of the best the Southern Pacific Zone has to offer and should help your stay here a trip you never forget. Try something new this year like sport fishing for a record Marlin (Marina Pe Vela). Zip Lining and exploring the tree tops (Hacienda Baru or Titi Canopy). Paddling thru the Mangrove with Tucanes Tours. Hiking thru some of the most beautiful National parks in the world. Just chillin at the beach, try parasailing or learn to surf ( Aquas Azules or Marcos). They will have you hanging ten in no time. So let the “Pura Vida” lifestyle set the pace for your 2018. Life is short…GO LIVE IT! 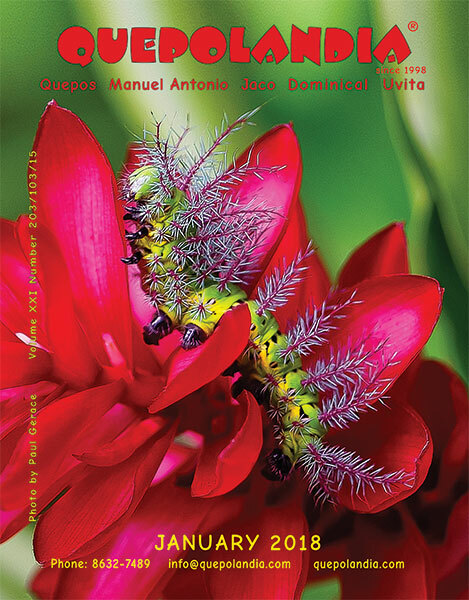 We want to thank Paul Gerace for his incredible hairy caterpillar on ginger cover. You can check out more of his photos at photosofcostarica.com, or buy his photo books on blurb.com or amazon.com. 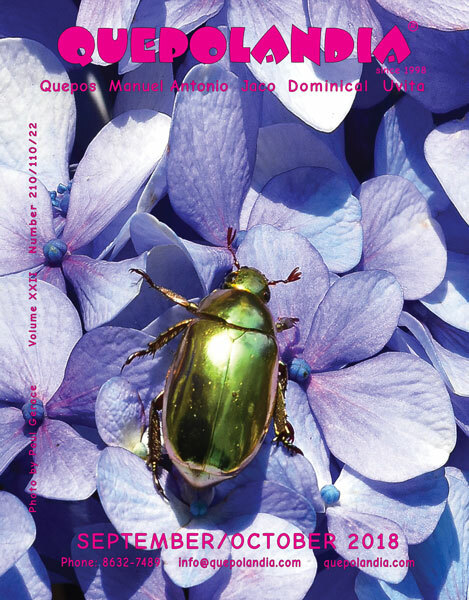 We are always looking for new covers so please send your best shots to info@quepolandia.com for future consideration. Looking for great food, great drinks, and NFL Football? Stop in to Jolly Rogers, Sanchos, or Double Hook to catch all the games. Also, great food, great music, and a great cause at PAWS Battle of the Bands, on January 28th at Ronny’s Place. We would like it welcome our new advertisers this month… Costa Rica Yacht Sales, Karma Lounge, Manuel Antonio Deli, Mogambo Bar, Shanti Spa, and SmartWebCR. We hope you enjoy our magazine and it helps guide you through this enchanting paradise we call home. You can always follow and share us here and at facebook.com/quepolandia. We appreciate and welcome your comments. Have a great New Year.